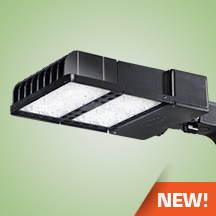 The Cutlass Series of high output LED luminaires are designed to be a replacement for HID area lights. It is optimal for lighting applications where long life, low maintenance, and consistent color rendering is required. Areas with limited accessibility due to fixture location or where heavy pedestrian or vehicle traffic makes maintenance difficult are ideal applications. The high wattage/lumen output allows the fixture to be used for parking, restaurant, quick service, shopping centers, or general area lighting applications. The heavy-duty housing is constructed of cast aluminum with heat dissipating fins. The optical assemblies are sealed in place using a silicone gasket for weather tight protection. Modular LED system for ease of maintenance. ETL listed for wet locations (IP65). Each fixture can accommodate advanced wireless control, management and reporting systems for outdoor lighting when ordered with the CTLARM mounting (required). A corrosion-resistant epoxy E-Coat layer that forms a uniform and all-encompassing protective barrier is applied to the fixtures prior to electrostatically applying a super durable powder coat finish. Standard colors available: Black, Bronze, US Green, White. Custom colors available upon request. Made with a state of the art UV stabilized acrylic high performance refractive optical assemblies that use high transmissivity materials to achieve precise photometric distributions. Available in Type II, III, IV, IV Automotive, Automotive Frontline Wide, IV Tennis, V Medium and V Wide beam configurations. Optics may be ordered rotated 90 degrees for perimeter lighting or walkway applications (optics are not field rotatable). Star Light Friendly (meets or exceeds Dark Sky requirements) in the horizontal position. Available in up to a 60,000 lumens output LED system in 5000K Cool White (+/- 500K) or 4000K Neutral White color temperatures. Available with 120~277V 50/60 Hz power supply. LED’s rated for over 50,000 hours at 25°C ambient temperature. 480V and 347V input option available. 0-10V dimming. Built-in surge protection up to 10 kV. Built-in Active PFC Function >95%/Full load. LED Power Supply conforms to UL8750 standards. Proprietary slide-on mounting system allows for quick installation. The CTL can be ordered with an aesthetically pleasing arm mount (CTLARM – required for integrating dynamic control systems), a 2” adjustable slip fitter (CTL2AF) for mounting on a standard 2-3/8” OD tenon and an entire compliment of pole brackets with integrated quick mount technology.